View all the Tracfone plans that work with the LG 305C. Compare Tracfone plans that are compatible with the LG 305C using our tool below. 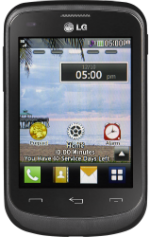 The LG 305C is a phone with a 3.2-inch touchscreen display with a 240x320 resolution and 125ppi index on the inside, a built-in capacity of 256MB, and up to 32GB memory expansion via microSD card. There is an included 2MP camera for photos and videos, internet and email access through Wi-Fi, and Bluetooth. The phone has received M4/T3 hearing aid rating. On the back is a removable 1540mAh Li-Ion battery that powers the device for up to 5 hours of talk time and 10 days in standby mode.